Discussion in 'POTW Collaboration' started by Serebii, Feb 24, 2019. This week we have an absolute classic! Pidgeot, the original common bird. While a staple on many Kantonian teams, including Blue's champion team (and being his first catch as well), up until Gen VI, there were many much better options. Then Gen VI came and Pidgeot got a Mega Evolution. 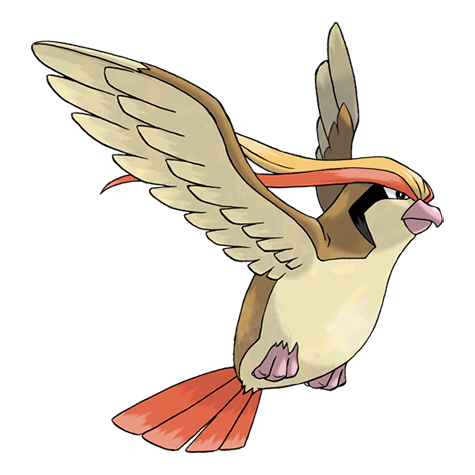 Normal Pidgeot is a flat out joke, and difficult to find on many modern teams. Mega Pidgeot is arguably the best abuser of Hurricane in the game and a threat to consider in UU and OU. Also the Pokédex says Pidgeot flies at a top speed of Mach 2. If it can do that, then how fast are the base 110s? Base 130s? Base 150s?? Or is speed more a measure of dexterity and flexibility? Mega Pidgeot is rather simple. Hit the field, slap down everything with Hurricane, pivot out with U-Turn, use Heat Wave for Steel types. You won't miss thanks to No Guard, though you won't be missed either which is unfortunate considering the shoddy accuracy of Stone Edge and Rock Slide. Last move is where we mix things up. Work-Up is Mega-Pidgeots lone method for boosting its SATK and can give it the ability to punch through Sturdier targets/resists if it can get enough up. Defog is for entry hazard removal, but Mega Pidgeot is unfortunately weak to Stealth Rock and does not benefit from Defog's other effect at all. Roost gives Pidgeot some much needed longevity. Featherdance -80/80/80 defenses are not that impressive, but Mega Pidgeot can stick around for awhile with a combination of this and Roost. Gimmick. While Rotom-Heat shares the same Rock weakness, it resists both Ice and Electric, which is a rather rare trait and makes it a good pivot for Mega Pidgeot and in turn enjoys Stealth Rock removal. Grass/Water types for their ability to take out Rock types and deal with Electric and Ice attacks respectively, but also unfortunately double down on another weakness of Mega Pidgeot. Weaknesses to common spread Rock, Ice and Electric moves, the former two having their accuracy issues vanish is a great deterrent for using Mega-Pidgeot especially considering using it uses your mega slot. Additionally Mega Pidgeot's best support move -Tailwind is seen on many other Pokémon who are better at setting up Tailwind. In short, Mega Pidgeots weaknesses make it outclassed in comparison to many other Pokémon and its Strengths, while impressive in Singles do not translate well to doubles. Background Information - Pidgeot the first early-bird Pokemon! From Rival to Ash! The early-bird trend all ends in SM. Is it just me or can none of the Pokemon canon's really decide what Pidgeot's size should be? One time it's as monstrously huge as Charizard in the anime and the next is just slightly taller than Ash, then we got the Origins and Adventures who depict Pidgeot around the same size of a Machamp. 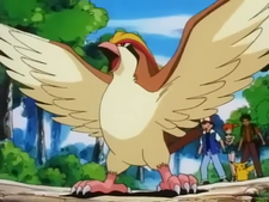 As for Pidgeot, this giant bird most famous appearance as one of Ash's strongest battlers, releasing it to the wild so Ash's Pidgeot could help defend a Pidgey population, quite heartbreaking for many kids on that day. However what some people may not know is that Pidgeot not only kicked off Ash's trend oif getting early-bird Pokemon from each generation but also kicked off rivals getting early-bird Pokemon from each generation and for Gen 1, that was none other than Blue's Pidgeot who not only made it's debut in the games but also the Adventures manga, Origins special and the Generations shorts displaying it's impressive wing power by overpowering Machamp's grip. 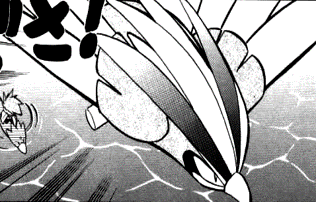 Also for many Chikorita users, Falkner's Pidgeot proved to be one of the hardest Pokemon battles early on in Gen 2. Mega Pidgeot hasn't really change from the last generation but that's okay since Mega Pidgeot is still fresh new to an extant. 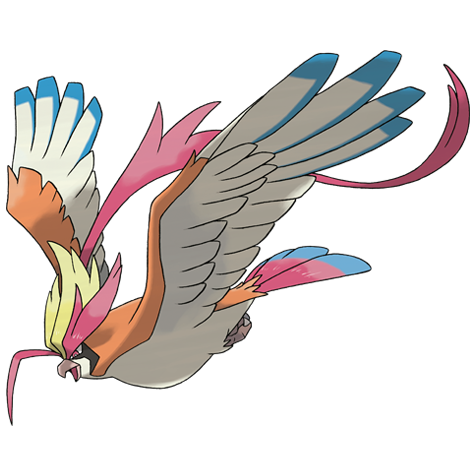 Mega Pidgeot is one of the most feared Pokemon in the competitive due to it's very great speed and it's even better Special Attack stats. In fact it's stats are so good that it's actually one of the very very VERY few Pokemon where the devastating but hugely consequential move Hyper Beam is viable in competitive thanks to also it's STAB, many people using Hyper Beam as a last-second effort to one-shot any Pokemon that's standing in it's way and man, Hyper Beam for Mega Pidgeot is devastating. 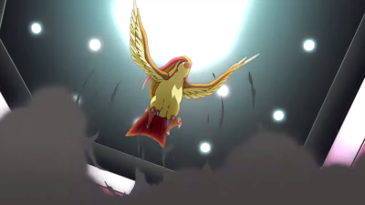 You could say Mega Pidgeot's Hyper Beam is his Kamehameha. Just like Son Goku from DBZ, your practically expecting him to turn Super-Saiyan and it's the same for Pidgeot. Your always expecting him to mega-evolve. In fact the chances of seeing a regular Pidgeot online is pretty rare because most people who are familiar with Pidgeot don't bother making use of it's original abysmal stats. In fact for some people, the Mega Evolution was a blessing to Pidgeot, so taking it away, what does that make the original Pidgeot? A very out-classed Pokemon but some people love using the originals so the best people can do with that is Choice Band to increase it's rather disappointing attack-stat to decent levels. Return is currently Pidgeot's only real dependable STAB physical move and is a good option over Brave Bird if you don't want to suffer recoil damage. There is also Quick Attack to finish off any Pokemon that have overstayed their welcome, suffering by an ounce of HP left. Other than that, regular Pidgeot isn't that good. In fact it might actually be even worst than Unfezant if it weren't for Mega Evolution. One weird, very gimmicky, and kind of cheap thing you can do with Pidgeot is pair it up with Landorus in doubles and get Mimic on it. It's a bit of a pain as Mimic is a move tutor move from FRLG, but Mimic can be used to get Fissure on Pidgeot. Pidgeot can then Mega Evolve and attack with No Guard Fissure. Landorus should cover a bit with Intimidate support, and Landorus can also set up Gravity for Pidgeot so that it can also hit flying or levitating pokémon with it. 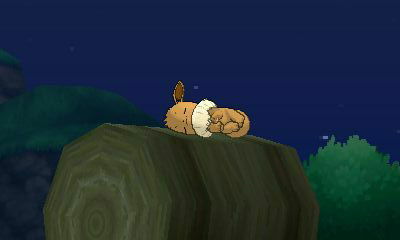 Or get Landorus out of there and switch in Oranguru so you can Instruct the Fissure and get double KOs. It's cheap and takes a bit of set up, but it's also quite funny if it actually works. Mimic is also a TM in Gen I games so the pain of transferring that move has lessened (added benefit of choosing nature, 3 perfect IVs, and HA—all which make training it easier). It also lessens the pain of moving one knowing Swift or Mud Slap if one so happens to choose. Also, Fissure is also a Gen I TM so you could transfer up any Pokémon from there that knows Fissure as it’s doubles partner as well. Getting nostalgic from Pokemon Stadium. So many Gen 1 rental Pokemon have the move mimic. Umm...I thought one-hit KO moves (Horn Drill, Guillotine, Fissure, and Sheer Cold) were banned from competitive play? Mostly because they are luck-based moves that have no place in a strategic game like Pokemon. Seriously, even a complete amateur could hypothetically beat a competitive pro if they were simply lucky enough. That's not to say you can't use this set for fun, but this is the same reason you can't use Mind Reader + Sheer Cold on Articuno sets (Though I suppose the opponent could just you know...switch out). No they aren't. OHKO moves are occasionally used. I recall that Guillotine was quite popular on Gliscor in the Spooky Cup last year for instance, to break through opposing Gliscor and Toxapex. Let's be honest, a lot of pokémon battling is just luck. Lucky crits, lucky with sleep turns, lucky freezes, a lucky Stone Edge avoidance, a lucky flinch on Rock Slide or Iron Head, lucky damage rolls allowing your Incineroar to survive Kyogre's Origin Pulse in the rain, lucky Sp.Def drops from Psychic, lucky poison hits on a Sludge Bomb, lucky paralysis on a Thunder, games are often determined by luck. And getting Fissure on a No Guard pokémon is like the least luck-dependent, it always hits as long as the enemy is grounded and doesn't have Sturdy.